Most of my posts follow the same structure. There’s an observation followed by an orientation to the idea of managing the business of you. This approach illustrates the first two steps of a process we all follow when awake. We observe or experience what’s happening around us. We naturally orient our experience to our map of how we think and feel things should be. This map is constructed of ideas and expectations formed from our history, purpose, abilities and intention. Once we orient ourselves to where we’ve been, where we’re going, our present capability, and present needs, we decide what to do and take action even if that action is to be patient and let things be as they are. 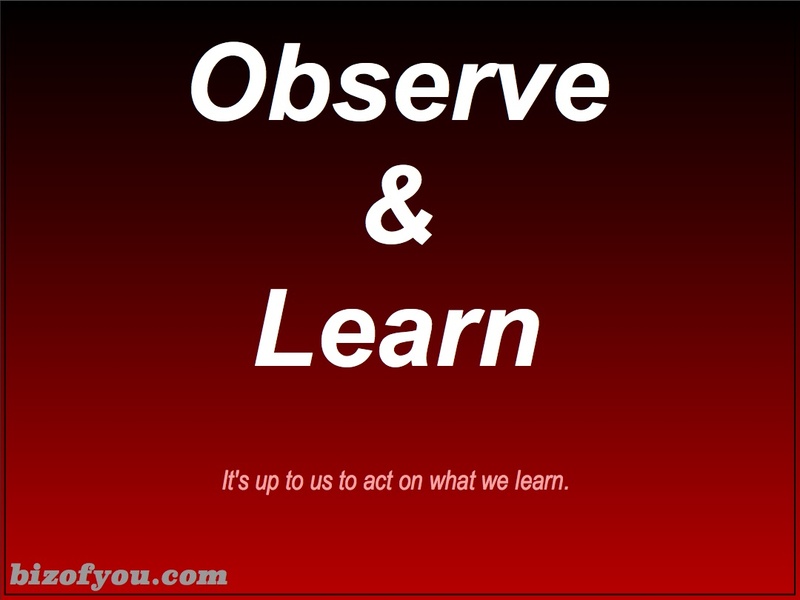 We all observe, orient, decide and act every day of our lives. This fundamental process operates at all levels from breath to breath to big strategic decisions about what we want to do with our lives. Once we complete one cycle of Observe, Orient, Decide, & Act (OODA), we do it again over and over throughout or lives albeit unconsciously. The OODA loop was formulated by the USAF strategist, Colonel John Boyd. John Boyd’s ideas significantly influenced modern strategic thinking throughout the world. If you choose to research his ideas, you’ll no doubt find his orientation centers around previous experience, new information, genetic heritage, cultural traditions, analysis and synthesis. I focus on history, purpose, abilities and intention as they more readily relate to the idea of managing the biz of you. I don’t focus on the second two steps of decisions or actions in my blog posts as those are ultimately up to each individual once they orient to their particular situation and environment. Plus, I really enjoyed a particular Taoist philosopher Lieh Tzu, who in some books, told a story and then related a “what I learn from this is” approach to communicating the Taoist arts. Sometimes the stories were funny, sometimes sad, but always something relatable to the Taoist philosophy. I think the same is true of the Biz of You. No matter what we experience in life, we can learn and ultimately improve our actions and better our lives. To do this, we have to make observations and orient to our personal business. It’s then up to us to decide what’s appropriate to act on in our daily affairs. Biz of You posts are structured in this way as that’s how we can improve.